Neufchatel style is that eternally perfect blend of traditional and so, so contemporary. 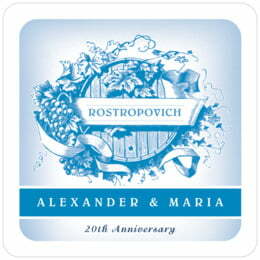 It is an absolutely classic and elegant wine label style. A lithographed image of an oak wine barrel encircled by plump grape clusters, grapevines and tendrils, and a banner draping across creates a front and center place for your winery name. The main font is a classic serif style in all caps, which increases the antique, vintage feel. A thin white border around the label is brightened with a deep textured shadowing along the edge, creating an even more vintage look. A bold bar of color across the bottom gives you room to put secondary text, and there is also room on this label for supporting text in a simple italic. Although the style name is Neufchatel, this label is perfect for any type of wine from any part of the world. Customize your Neufchatel coasters today! Neufchatel coasters are made of extra-thick 58-point board. To give you an idea of how thick they are, a stack of a dozen coasters is about 3/4" tall. They are made of absorbent pulpboard to help protect your tabletop. 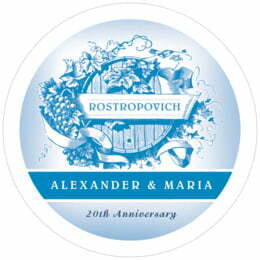 The coaster surface has a smooth matte coating to provide beautiful, crisp printing. Each coaster is carefully die-cut in a letterpress, which gives the top edge its distinctive rounded shoulder. We use a digital 4-color, high-resolution press for fine detail and rich color. All of our personalized coasters are designed to match our labels, tags, and other products, so when you order multiple items, you get a matched set. On the back of each coaster, a small Evermine logo is debossed (pressed into the paper).